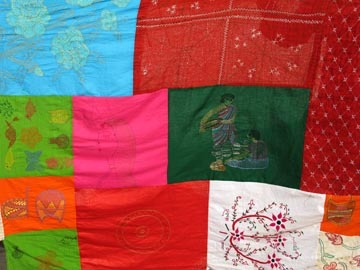 Quilt making, commonly known as Kantha making is a very favourite collective activity of women in Bangladesh. On the occasion of 100 years of celebration of International Women's Day with the participation of women from rural and urban areas, it was considered very important to involve a greater section of women to record how they feel and how they wanted to express themselves. Kantha making, that is expressing without pen and paper, was the best way to bring all women, literate or illiterate, together to express themselves in a piece of cloth. Even for the educated women expressing always in written words is not possible. Drawing a piece of art also demands special skill. But needle with colourful threads and sitting with friends, sisters and neighbours is still a practice in the rural areas. Kantha making is a collective initiative of women practiced for hundreds of years. For the city women, such practices have reduced but not entirely disappeared. 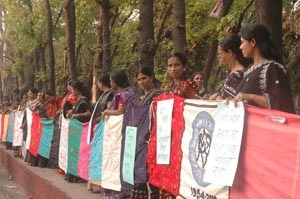 The plan for quilt making was made on the 19th January, 2010 when the National Committee was formed. Women coming from in different parts of the country decided to make embroidered designs to express their feelings on women's rights and women's achievements in a Kantha. Every organisation or group of individuals made embroidery on a piece of yard long cloth. The colours of the cloth were different and there was no direction for any designs except that besides embroidering whatever they like, they may draw pictures of women leaders, their own mothers, sisters, any village women or write anything (by embroidery). With very limited instructions, a months' time was given to the members of the National Committee to bring at least 100 pieces of one-yard embroidered cloth to be joined together as a 100 years' Quilt. 1. biodiversity - with flowers, butterflies, birds, medicinal plants, animals, river, rural areas etc. 3. women's rights ( in written demands) and particularly picture of Begum Rokeya, women , women making up hair together, etc. 4. women's culture with pictures of palki, women going in a bullock cart, tulshi plant, dol, ektara, dhol, violin etc. 5. 'women want peace' with pictures of flower in women's hands, pegions flyting in open sky, children taking bath in river and women of three generations. Twenty deep and light coloured threads were used in the embroidery designs. These were, 1. white, 2. deep majenta, 3. red, 4. parrot green, 5. pink, 6. off white 7. light green 8. blue, 9. purple, 10. yellow, 11. orange 12. green, 13. black, 14. brown, 15. brick red, 16. cream, 17. olive, 18. sky blue, 19. 'boiled' olive, and 20. deep orange. The stitching types were different and had different local names. These were 1. Jor selai (paired stitch), 2. chain stitch, 3. cross stitch, 4. dhal (cover) stitch , 5. button stitch, 6. carpet stitch, 7. nakshi stitch, 8. tajmahal stitch, 8. sagu stitch, 9. bhorat stitch etc. There was lots of enthusism in kantha making. These were all sent to Narigrantha Prabartana after 28th February, where 10 pieces were joined together to be able to display in different events. Shoto bocherer shoto kantha was inaugurated by women participating in the exhibition on 6th March at Prabartana. From then on it was used in the Women in Black on 6th March in front of Narigrantha Prabartana, on 7th March in the Tribunal at the National Press Club and on 8th March at the Central Shahid Minar in the rally of thousands of women organised by Samajik Protirodh Committee.